We will be participating in Pam’s Boutique for our final time this year. The dates and times are: Monday November 18th from 4pm to 9pm, Tuesday November 19th from 9am to 9pm, & Wednesday November 20th from 9am to 7pm. The location is at Embassy Suites Valenica: 28508 Westinghouse Place, Valencia, California 91355. 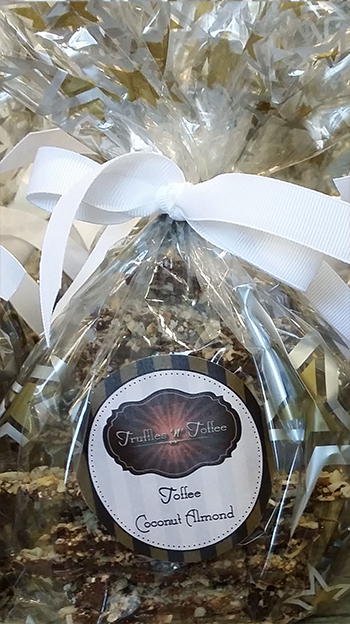 We will be featuring the following toffees <Original English & Peppermint>, our Wine Truffles available in two flavors <Pineapple Chardonnay & Orange Cabernet Sauvignon> and our New Fall Truffle Line. We will be sampling our Pumpkin Pie and Peppermint Crunch Truffles. 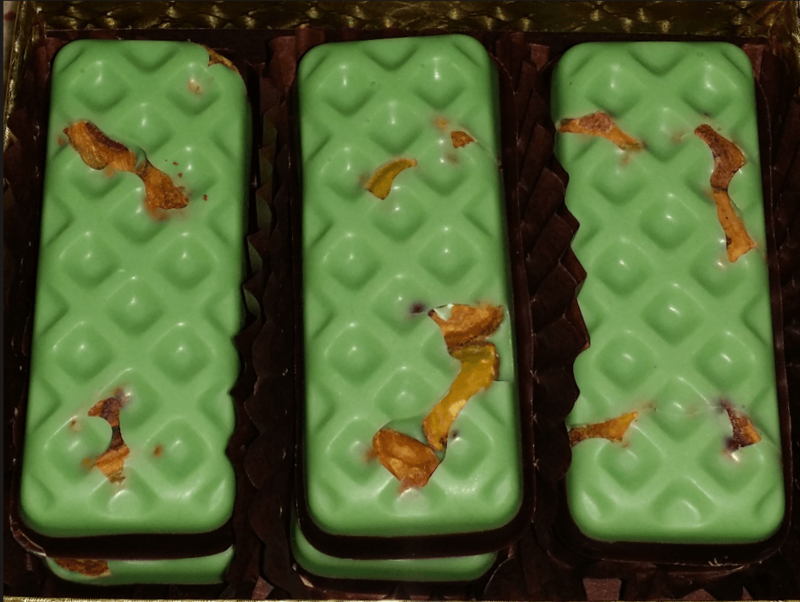 We will also be selling our New Limited Edition Caramel Cris-P Squares. 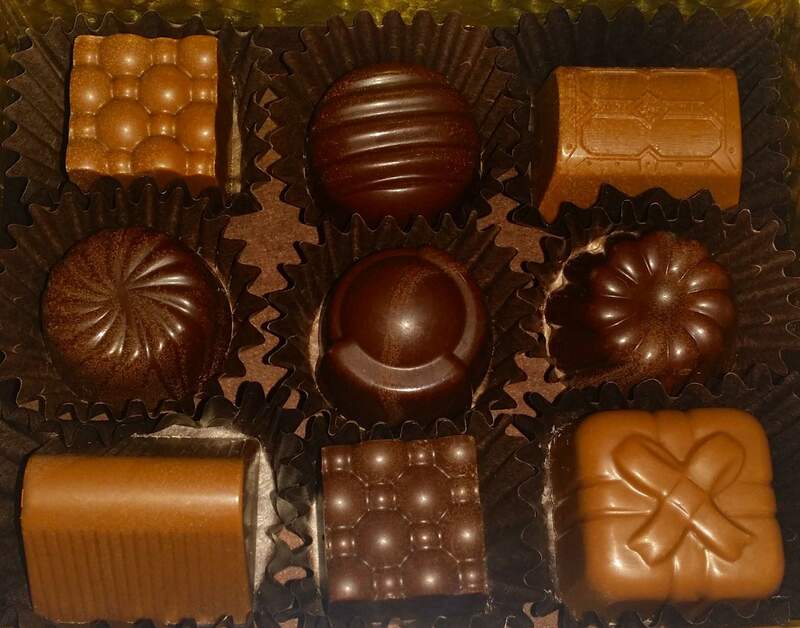 These amazing squares start with a mouth-watering square of marshmallow puffed rice, covered in a soft and smooth hand-made caramel and hand-dipped in your choice of Milk or Dark Chocolate. They were so popular last month, we sold out of them completely. Fortunately, we will have a whole new supply ready for this event. They can easily be cut into pieces for sharing! This Boutique is being hosted by Congregation Beth Shalom located at 21430 Centre Pointe Parkway, Santa Clarita, Ca. This will be a wonderful opportunity to get those last minute Hanukkah gifts and/or bring some goodies for you and your guests for Thanksgiving! This is a FREE event! Hosted by the Westlake Village Junior Women’s Club as a non-profit organization, they endeavor to raise as much money as possible to support other non-profit organizations serving the Conejo Valley. This year, the 32nd Annual Gingerbread Boutique will be held on Thursday, November 14th, 5:00 pm –9:00 pm; and Friday, November 15 th, 10:00 am – 6:00 pm. The Boutique will be held at 5801 Kanan Rd, Westlake Village, CA 91362 (St. Maximilian Kolbe Catholic Church in Westlake Village). Thursday night is a ticketed event at a price of $30. For tickets, please visit: www.westlakejuniors.org They will be serving cocktails and having hosted hors d’oeurves catered by Merlyn’s Kitchen. Guests who attend this event will also have the opportunity to participate in their special raffles. Friday’s event is free of charge! We will be located at 789 N. Altadena Dr. in Pasadena. The cross street is Alta Loma Dr. The boutique will be in the church lounge. The preschool shares space with Pasadena Christian Church. The parking lot is located on Alta Loma Dr. The boutique hours will be 9:15-12:15 Tues/Wed/Thurs. We will be participating in Pam’s Boutique once again. The dates and times are: Monday October 14th from 5pm to 9pm, Tuesday October 15th from 9am to 9pm, & Wednesday October 16th from 9am to 7pm. The location is at Embassy Suites Valenica: 28508 Westinghouse Place, Valencia, California 91355. 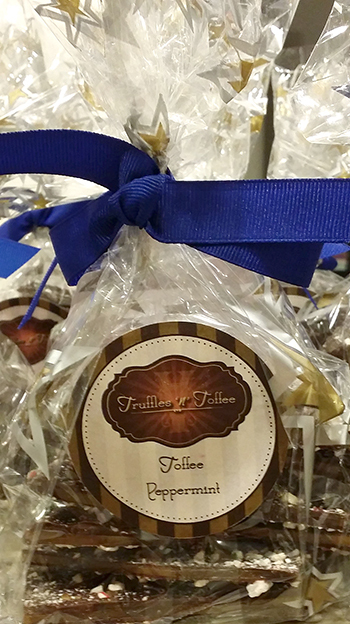 We will be featuring 3 of our toffees <Original English, Almond Road & S’mores>, our new Wine Truffles available in two flavors <Pineapple Chardonnay & Orange Cabernet Sauvignon> and 2 truffle flavors of our New Fall Line <Pumpkin Pie & Espresso>. 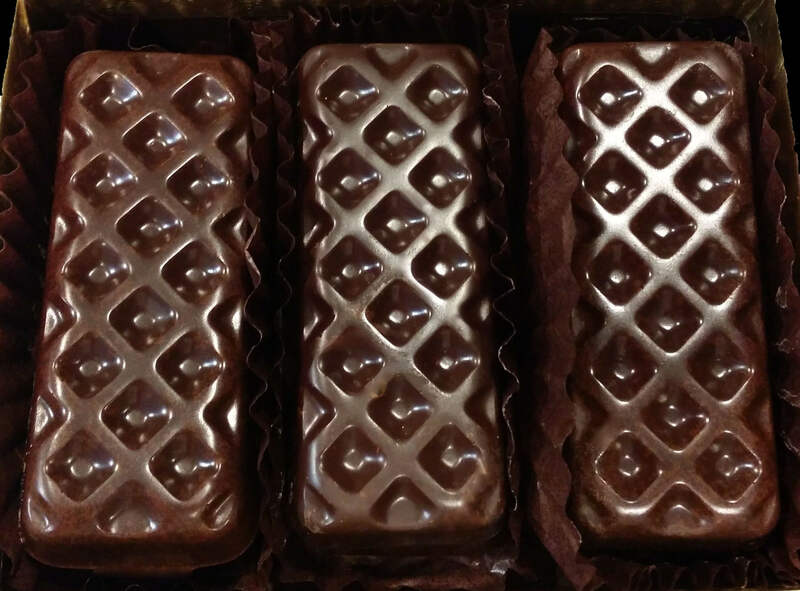 We will also be selling our New Limited Edition Mini Bites Line featuring an array of solid chocolates <gingersnap, peppermint, cherry, coffee, and pistachio> and our NEW Caramel Cris-P Squares. 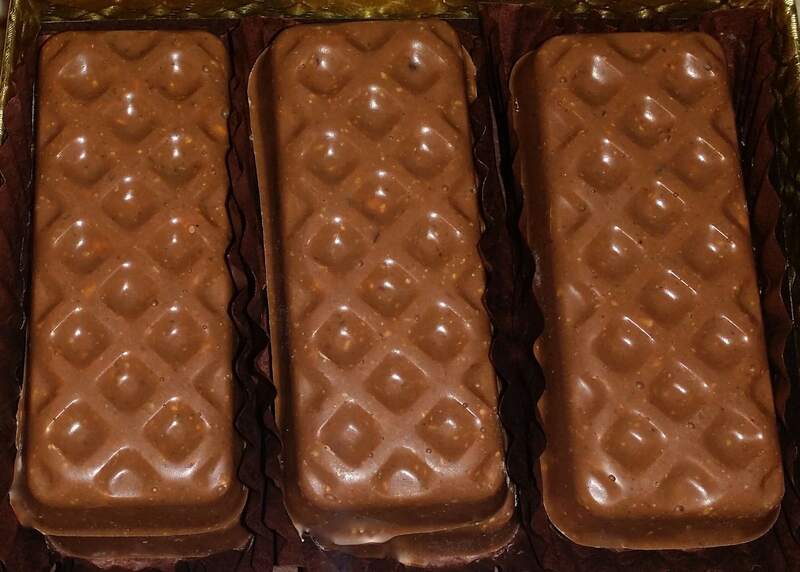 These amazing squares start with a mouth-watering square of marshmallow puffed rice, covered in a soft and smooth hand-made caramel and hand-dipped in your choice of Milk or Dark Chocolate. They can easily be cut into pieces for sharing! This is a great event filled with lots of wine tasting, plenty of food, TRUFFLES ‘N’ TOFFEE chocolates and toffee, and great entertainment. Also, if you would like us to appear or participate in any upcoming events, fundraisers, holiday parties, or other social gatherings, please contact us! Let’s work together to make your event or holiday a SWEET one! We are at Reyes Winery in Agua Dulce pairing our truffles with Reyes’ wonderful wines. 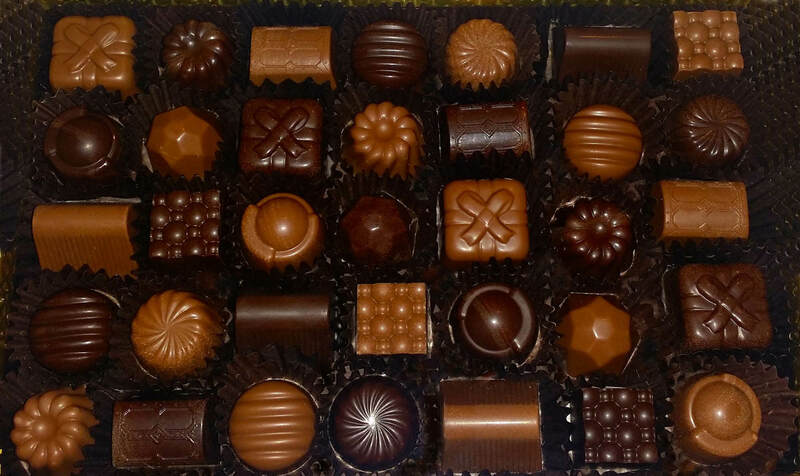 We also sample and sell our new Wine Truffles Line. Come up and join us at 10262 Sierra Highway Agua Dulce, CA 91390. Please contact the winery <(661) 268-1865> for wine tasting prices; our chocolate samples are complimentary with your wine tasting experience. We will be participating in Pam’s Boutique. The dates and times are: Monday May 6th from 5pm to 9pm, Tuesday May 7th from 9am to 9pm, & Wednesday May 8th from 9am to 7pm. The location is at Embassy Suites Valenica: 28508 Westinghouse Place, Valencia, California 91355. 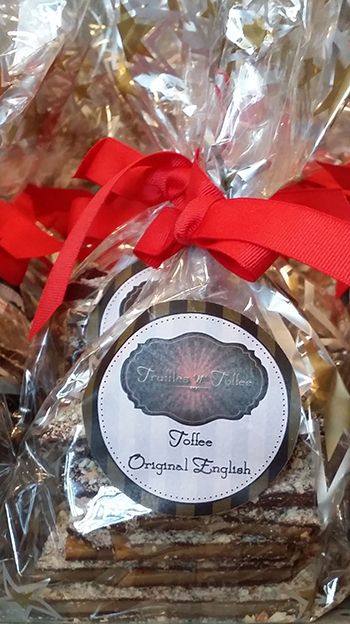 We will be featuring 3 of our toffees <Original English, Almond Road & S’mores>, and our Spring Truffles Line! 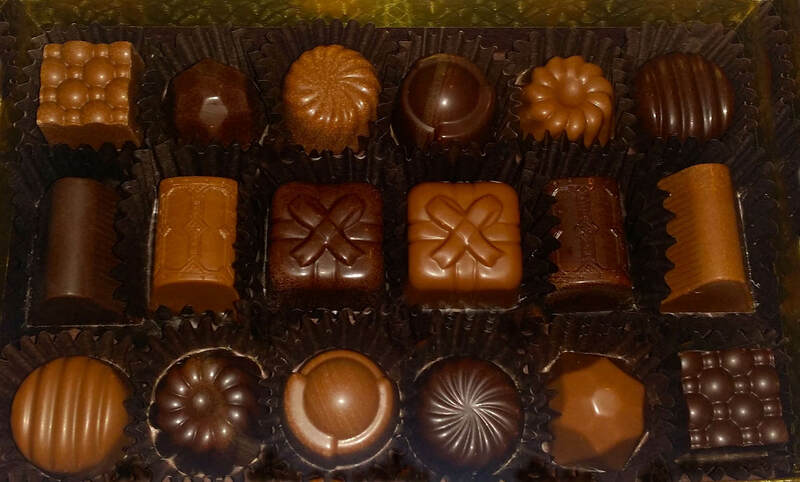 We will also be selling our New Limited Edition Mini Bites Line featuring an array of solid chocolates: cherry, lemon, banana, coffee, orange and pistachio! This a charity event to benefit the Henry Mayo Newhall Memorial Hospital. There will at over 30 wineries and breweries and plenty 0f gourmet food & specialty venues in attendance. This is a ticketed event. We will be unveiling our new Alcoholic Truffles Line and will be providing FREE samples at this event!